A Visit To The ‘Sticky Institute’. I’d been in Melbourne only a few days when it occurred to me that I needed to find a source of typewriter ribbons. As such, I promptly turned to the internet and put a call-out over twitter. Naturally, I included the typosphere’s resident agent on the ground – Teeritz, in this call out, knowing that he’d have a much better knowledge of what would be available in the city. Teeritz came back pretty quickly with a few suggestions – one of which grabbed my interest. Of course! I remember the Sticky Institute. They were the people that ran that ‘I am typewriter’ get-together a few years ago that Teeritz, Tom (from Tom’s typewriter shop) and Rob were all at. 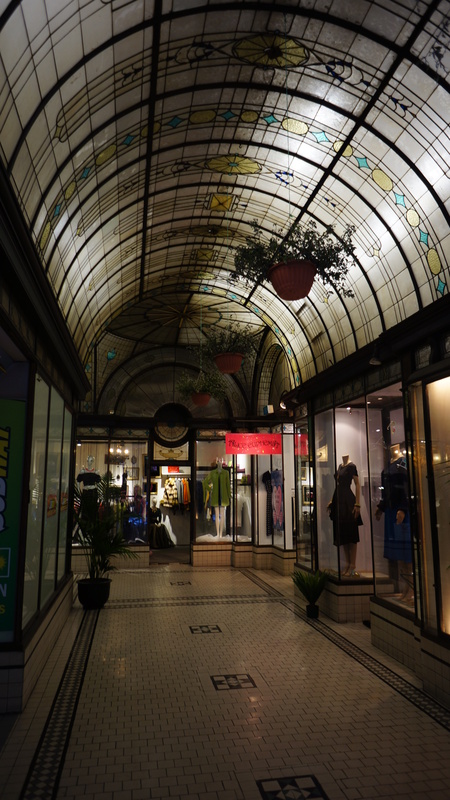 I also knew the row of shops that they were located in, as Miss Jane and I had stopped in at one of the neighbouring shops in October last year, where she bought some jewellery. 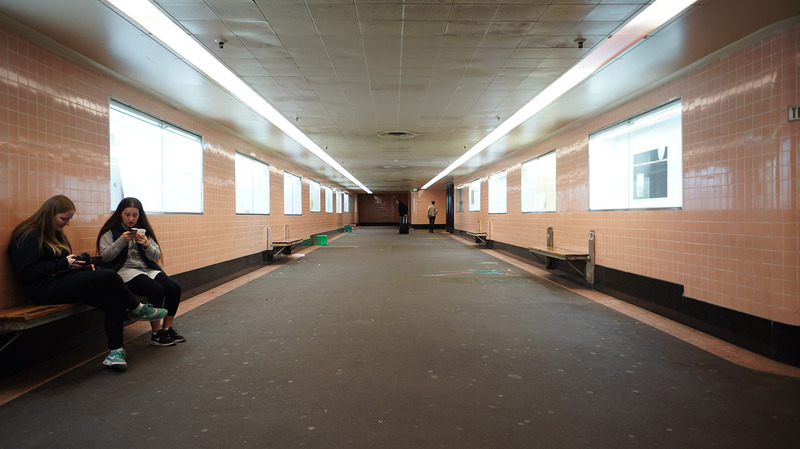 It is an odd location that is built in a tunnel that is located underneath one of Melbourne’s busiest roads, and was constructed in the 1930s in a style very reminiscent of ‘The Tube’ tunnels in the UK. I used to hang out there occasionally some time back, as there once was this incredible record shop there called ‘Smashed Whacked’ that specialised in obscure 60’s vinyl. As it happened, The Sticky Institute was located right next door to where that shop used to be. So I got my stuff together and headed into the city on a tram. The Sticky Institute didn’t open till about 2pm, and even then that is considered a ‘soft’ opening time – with no guarantees that they would open then, or even at all. On the way I passed a shop with a familiar looking item on display in the front window. Because, you know… nothing says ‘Vintage’ like a Remington 16 in rusty and broken condition. Anyway…. I just took a snap, checked out the cool bench and chair that were also part of the display (which I would LOVE to have) and I moved on. 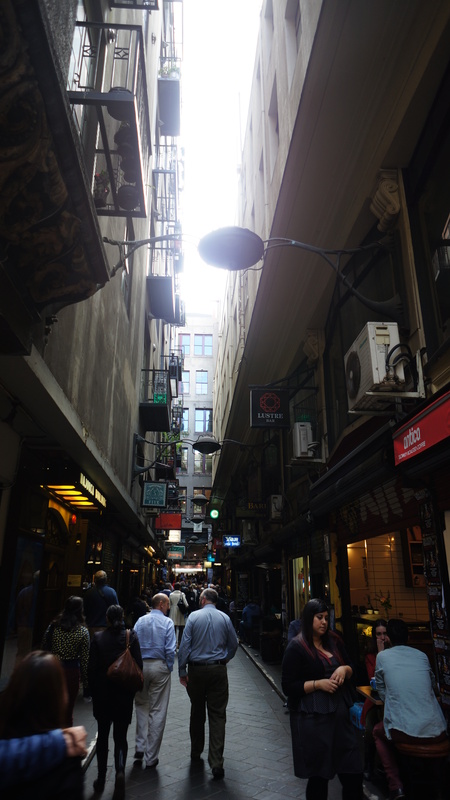 Melbourne may seem like a city of wide streets and trams, but a lot of the culture of the city is to be found in the tight alleyways that have largely remained since the late 1800’s. Recently space in some of the more popular alleyways has become a heavily contested. I was heading to Degraves street, but I ended up passing through a few other them on the way. Degraves street itself is a world of difference to how I remember it 10 years ago. Back then it was a rubbish filled street, graffiti lined alley that you felt uncomfortable walking down. Now it is a dense strip of cafes that are so full of life that it is a struggle just to push your way through some of the crowd and get to the other end of the street. I took this shot a fair bit later when the cafes were packing up for the day. It is still partially graffiti filled, but the rubbish has been mostly cleared. To be honest, the graffiti is often what makes Melbourne feel more of a city than Brisbane. It has that ‘cultural bleeding onto the streets’ feel about it. Even if it would give me the sh*ts if they tagged my own front door. In order to get to the Degraves street tunnel, you descend a set of very dodgy looking stairs located on Flinders Street that are adorned with cast-iron signage from a very different era. 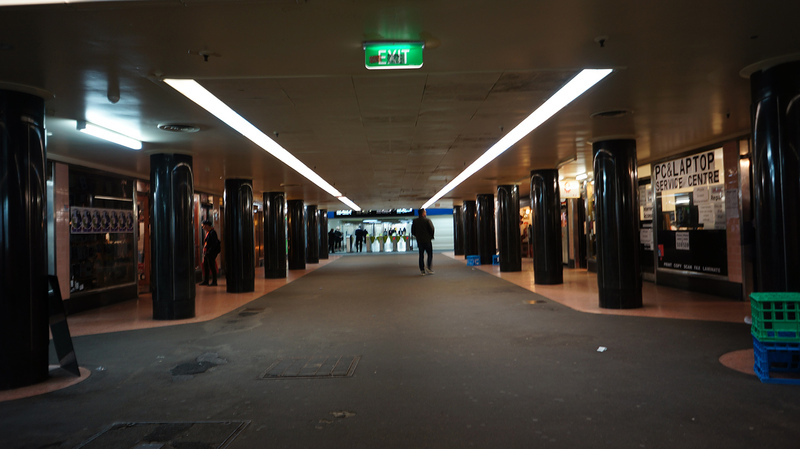 You used to be able to enter the tunnel from further back in Degraves street, but in the 90’s before the area had been gentrified that exit was closed because it was simply too unsafe to exit there. Too many people had been attacked by loitering drunkards from the Young and Jacksons pub up the road. The ‘blink and you’ll miss it’ Sticky Institute. The tunnel is a bit of a time warp really. Too cool and interesting for anyone to leave for developers to turn into some ghastly heavily lit shopping strip. Too out of the way and odd for it to attract a high amount of users. 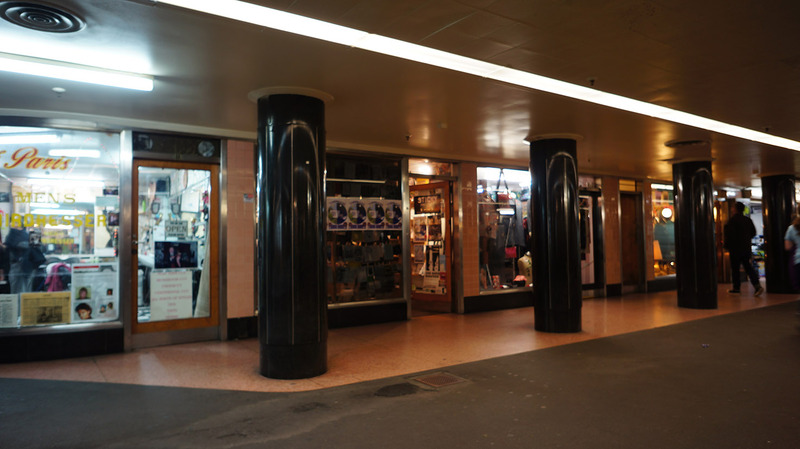 Most Melbournians don’t even know about the Degraves street tunnel, and that’s what has made it into the odd little secret that it is today. With such close access to the train station, it is the perfect location for the Sticky Institute in that it provides reading material to casual commuters, while being nicely placed for cash-strapped students to access. And the spot just feels… moody and cool – with an air of interesting discovery to it. The space itself feels a bit cramped – no matter how big the shop looks in the photos on their Facebook page. Or even their own blog. 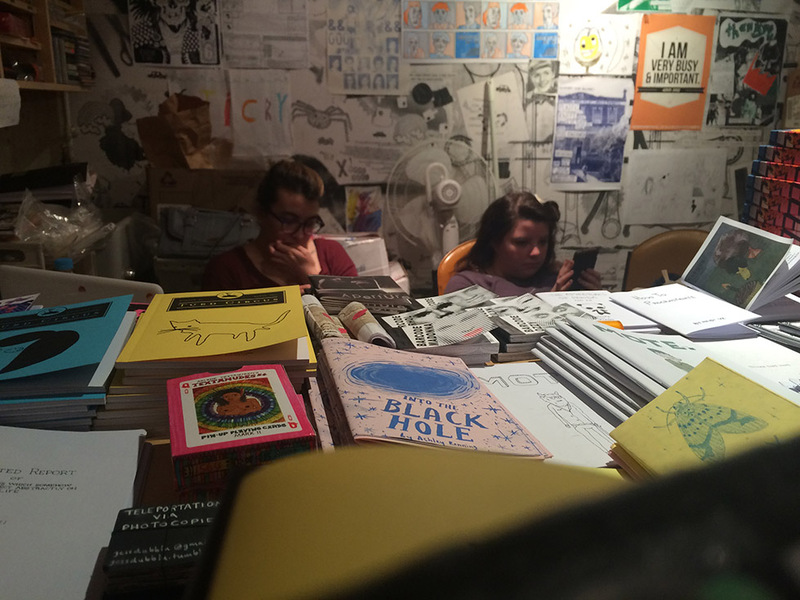 Their focus is mainly on the publication (and selling) of Zines and as such there’s an assortment of equipment laying about for Zine makes to swing by and make their own publications with. Pens, textas, coloured pencils, scissors, guillotines, glue, big-arse staplers, a massive photocopier and (of course) typewriters. Actually, I was quite impressed. Seeing that old Monarch made me feel right at home in the establishment, and I felt an urge to just want to sit down and type. But the shop was already full of 6 other people, and my large frame would be a bit of a show-stopper for people wanting to get around and check out the shelves. Maybe I’ll just rock up with one of my own typers one day and add a bit of flair to the proceedings – and see if I can encourage some others to hop on the machines already there and type. The more I looked, the more typewriters I found. 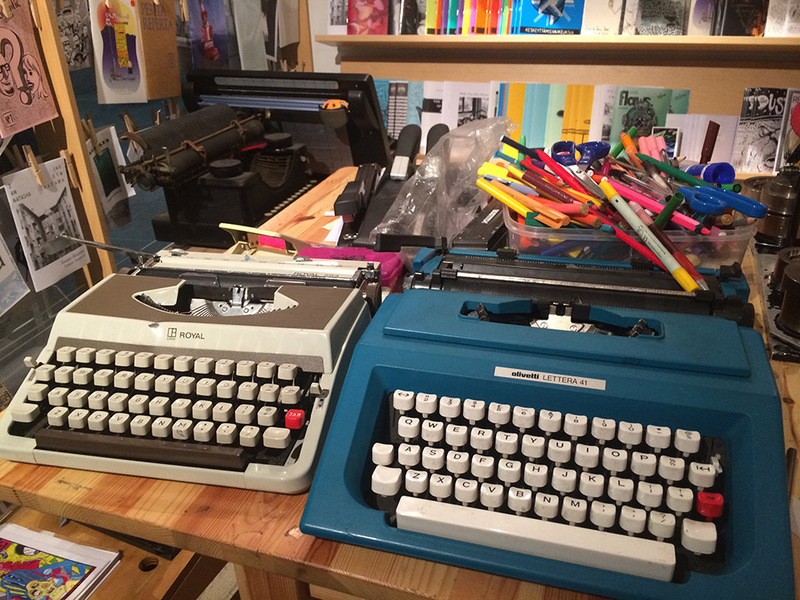 They battered and well-loved machines that were stacked into little hiding spots – just waiting for someone with a bit of writing love to come by and grab them out. I’ve always had a bit of love for the Zine – despite (as yet) not publishing one. They’re great little introspective publications that are often filled with surprises. Not just writing, but photography and art. They fill a gap in our literature world that books and magazines don’t feel, and the internet has turned into a 160 characters or less void of disjointed meaning. One particular typospherian – Vanessa Berry, is a great exponent of the zine. She’s also been here to the Stick Institute as well – and photos of her chilling out with some of the Melbourne Zine writers (Vanessa is from Sydney) can be found on the Sticky Facebook page. I had a look around the shelves and found half a dozen interesting zines, which I then took up to the counter. A couple of women on the other side were too busy with their mobile phones and a broken conversation with each other, to notice I was there. Either that, or they noticed and weren’t interested in responding as yet. But let’s face it. This place isn’t about the customer service. It isn’t a shop. And the very laid back nature of these two were perfect for the atmosphere. With a bit of a friendly ‘hello’, the two of them roused from their phones, hunted down the typewriter ribbons that I had been seeking (which they only had two of in stock) and took my money for the zines. They were both friendly and great to talk to. One of the zines I purchased didn’t have a price on it, and they scurried about the shop looking for it. Actually, this is the kind of thing I love. I hate walking into somewhere and having half a dozen people breathing down your neck to help you. 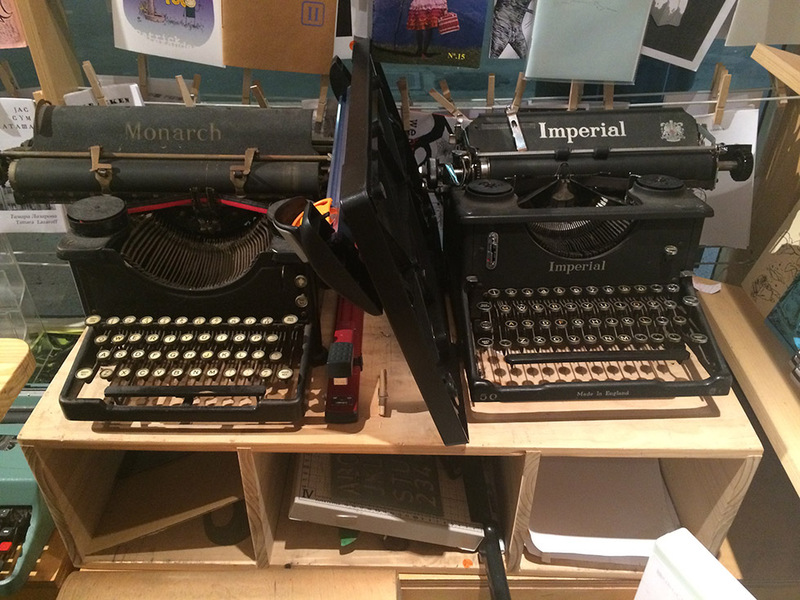 So I felt very much at home here – amongst the typewriters, people and heavily miss-spelled publications. Heck, ‘The Sticky Institute’ even sounds like a relative of ‘The Filthy Platen’. I think I might have to explore what goes on around there a lot more. I packed my bag (I wished I had my Gossen Tippa in it that day) and then bid the shop keepers farewell. I was then off and on my way back up to Flinders street. 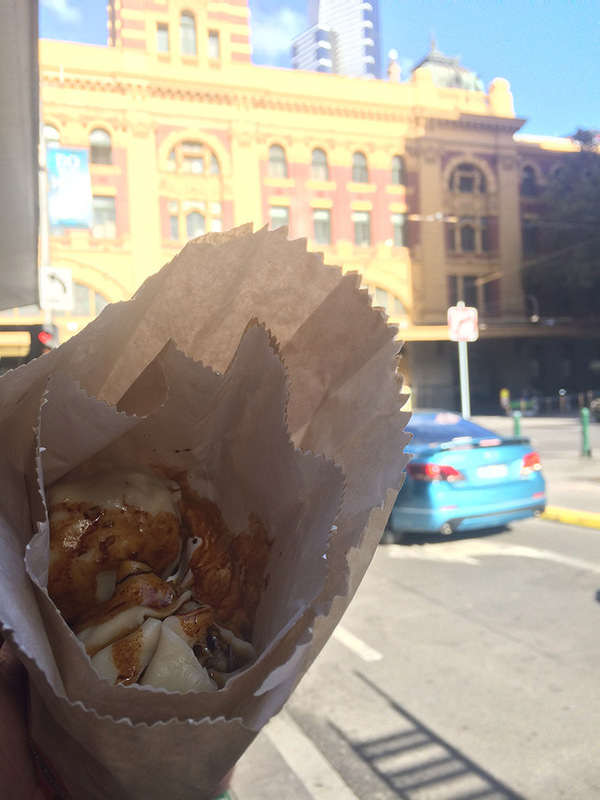 But I was soon looking for lunch, which I found at the rather famous ‘South Melbourne Market Dim Sims’, which had just set up a shop just off Flinders street. Oh… my…. how I have missed those Dim Sims while I lived interstate. And from there it was back out and checking out the life in Melbourne’s alleys again. 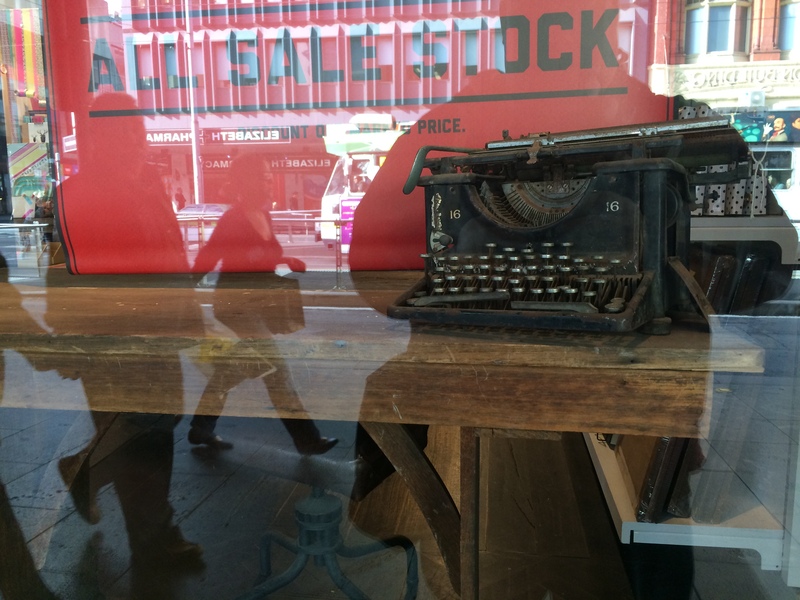 A visit to Tom’s typewriter shop. ← The ‘new’ Filthy Platen, and a privacy shock. Better to by a ribbon in person than on the Internet. I just bought a red and black Remington ribbon, unopened, still in its original packaging, and so dry and mouldy it wasn’t at all “sticky”! Gah! But did it at least have the original spools? That would be worth it at least. Great pictures, Scott. Now I feel like heading into town to get a coffee. Despite the fact that I have a machine at home. I walked that Degraves Street underpass twice a day for eleven years and I’m glad that Melbourne City Council haven’t made any changes to it. Hopefully they never will. I’m with you there. I have always loved that little patch of underground. It always has an interesting variety there. Looks like a great little place. Definitely. I think I’ll have to hang out a bit more often. 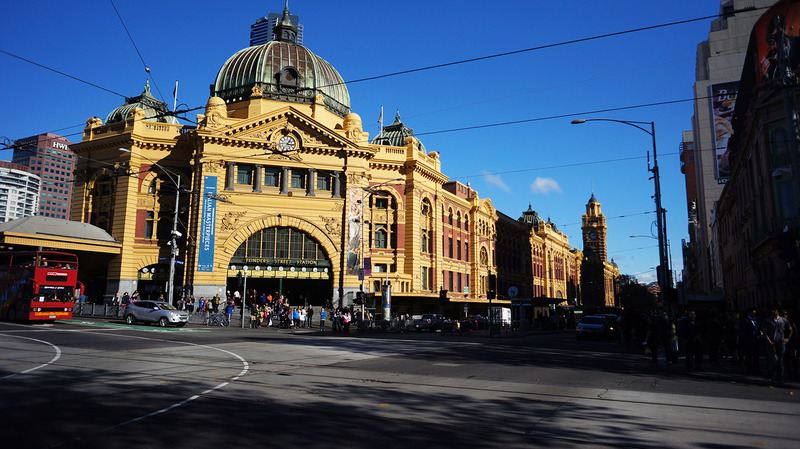 Great to see this post but makes me really miss Melbourne! I went to Sticky Institute last year when i went to Melbourne – I live in the UK, and I loved it! It was great to see the place the zine YOU had come from and to see the typewriters and zines all together it made me a bit sad to think I was missing out being all the way over here in England, but great to see that people are doing this though! It is lovely little spot for sure. Surely there’s a few similarly interesting spots there in the UK. Got any ideas? I might have to visit over there sometime soon! And thanks for dropping by. Oh, I see you have a blog to! I’m going to have a bit of a look at this. Thanks for checking out my blog and adding me! It’s good to see a fellow typewriter creative on here 🙂 I did actually open a mini zine shop based inside an old caravan a few years ago called Caribou, but it ended sadly due to lack of funds! hopefully I will start it up again one day. My bro just moved from melbourne to brisbane – must be one in one out!